"Our ocean is in trouble. The entire world must come together to try to change course and protect the ocean from unsustainable fishing practices, unprecedented pollution, and the devastating effects of climate change, or we run the risk of fundamentally breaking entire ecosystems.” says Secretary of State John Kerry. Few policy makers able to make a difference at every scale, but Secretary Kerry has been an staunch ocean supporter for more than four decades. His love and respect the ocean, was instilled at an early age—clamming, fishing, and sailing in Massachusetts (in Buzzards Bay and on the Cape) and serving in the Navy spending time on many Pacific Islands. As a U.S. Senator for 28 years, he worked hard to restore the health of Boston Harbor and to shape legislation that would encourage coastal states to implement strong coastal zone management plans. He served as chairman of the Senate Oceans & Fisheries Subcommittee where he updated the landmark Magnuson fishery laws several times to include important provisions for sustainable fisheries and bolster ocean conservation. 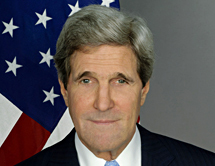 As Secretary of State he has integrated oceans, climate, energy, and other critical global environmental issues into the mainstream of U.S. foreign policy. He has advanced efforts to end Illegal, Unreported, and Unregulated fishing, and encouraged President Obama and other world leaders to expand marine protected areas such as the U.S. Pacific Remote Islands Marine National Monument, which expanded six-fold in size and is now the world’s largest MPA. He initiated and hosted the first “Our Ocean” global leadership conference in June 2014, bringing together government leaders, scientists, environmentalists, the private sector and other civic leaders, to discuss the threats facing our ocean and catalyze innovative marine conservation ideas. As chair of the eight-nation Arctic Council Secretary Kerry will bring an appreciation for this fragile climate-impacted region to the important deliberations on its future.